This, That, and T'other: Gobs of Green~ AKA My Very First Giveaway! Gobs of Green~ AKA My Very First Giveaway! Welcome to all of you who are dropping by from SITs. Please feel free to check out my blog and tell me what you think! I love your comments, ideas, and suggestions! I have thoroughly enjoyed participating in giveaways at quite a few blogs. I have even won a few. Today, SITs is having its Spring Fling (click here for details). A lot of the SITstas are having giveaways on their blogs, so I decided to host my first ever giveaway. When I was trying to come up with something to give away, I kept coming back to the idea of green/St. Patrick's Day. So, here are the goodies you can win. 4. Green mini-shatterproof ornaments ~ save them until Christmas, or use them now in a vase or a bowl for a beautiful springtime display. So, what do you have to do to win these goodies? It's easy, really. Each of the following counts as one entry. Make sure you leave a comment for each entry (i.e. I am following you). ~ Follow me . . . if you already do, let me know, that counts too. ~ Become a fan of my blog on Facebook . . . click the button on the left side of my page. ~ Post about this giveaway on your blog, with a link back to my blog . . . please leave a url in your comment so I can check out your awesome blogs. Yes, you read it right! There are seven ways to get your hands on all these green goodies. The winner will be chosen by Random.org on Saturday, March 14th after 12:01 AM. Unfortunately, due to shipping prices, this giveaway is only open to citizens of the contiguous 48 states. Winner will be announced on my blog. Be sure to leave your email or blog address so I can contact you by email/blog if you win. What a fun giveaway. Green is one of my favorite colors. I love green sherbert. Am I really the first to enter?? What a great collection of green goodies!! My favorite green thing? My husband's eyes!!! DREAMY!!!! Would love to win! I love the green hills in Ireland...never been, but hope to go someday! Happy Spring Fling! Isn't Spring Fling Fun!! Unfortunately us teachers can't be consumed by it all day!! I am stopping by before I start my day! Green is not really one of my favorite color and the VERY first thing that popped in my head is Money! Is that Bad? OH and I am already follower!! Great Giveaway! I love broccoli, really! I LOVE Green beans and green m&ms. :) Cute giveaway! I'd love to win! I love when my lilacs are finally green...I'm still waiting for that this year. Green things I love: frogs, turtles, key lime pie, and Tinkerbell! This is cute idea for a giveaway. Thanks for the chance! Following you on Twitter as superjaxster. I love green grass...and wish I had some right now...I'm sick of New England winter!!!! Green is my favorite color! 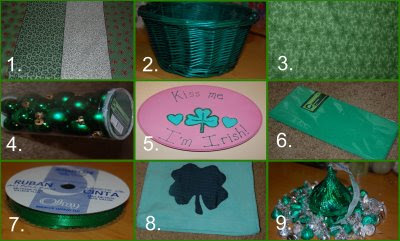 I am having a green giveaway too so stop on by. I love new shoots of grass that are green & fresh! Wow! Looks like I'll be first! Hmmm...something green I love...is my eyes. Being irish myself I also have a thing for clovers, ivy, or any type of green foliage/plant life. i love green grass! seriously! it means that spring is here and i love warm weather and green trees/grass etc! I like green! Especially M&M mint premiums!!! Wowee! You are super creative!! My favorite green thing is my 5 month old son's beautiful eyes:) Thanks for the chance to win! This is a great grouping of stuff! I love asparagus and that is green. Happy Springtime. Cute idea for a contest! Green is my daughters favorite color and it must be mine too because we painted our entire downstairs green, our kitchen green and my daughters room green!Right now I would love to see some green grass as I'm tired of the dead brown grass and ready for spring! Thanks for the chance to win! I like, no love the plants in my garden!! And I like this green giveaway even better! Green is my favorite color, because my eyes are green. And I look pretty good in green...so my one thing I like that is green is my eyes! LOL! I love my baby's green eyes! I love green grass, and leaves on trees. Can you tell I'm ready for winter weather to be over? I love fresh green spring grass!! I love that basket!! It's adorable! What do I love that's green? Mint chocolate chip ice cream! Lots of fun green stuff! Green things I like: grass, plants, and my son's green St. Patrick's Day hat! Green is one of my favorite colors! I love most everything green! Right now, I'm loving the green clovers that are growing everywhere. They feel so soft and cool under your toes (sorry for all of you still suffering through winter, we're enjoying temps in the 80s). Green thing I love...my house. So many don't have one right now ...mine may be small but it's filled with love. Besides money, my favorite green thing is the new buds on the trees that will be popping out soon! They make me feel renewed. Love your giveaway and thanks for coming by my blog today. My fave green item is my Green Apple Kitchenaid Mixer!!! Money! Lol. I love green eyes and green leaves budding out, fresh cut green grass and four leaf clovers. I like spring green, little buds on weeping willows. Way Fun! My favorite thing that is green is grass... I hope to see it soon. Enter me! Hi Bethany! Great Giveaway! I love when the trees are full and lush with their green leaves. I am heading back to post about your giveaway on my side bar.